I'm glad you asked. LCPC stands for Licensed Clinical Professional Counselor. In Maryland, licensed counselors are all considered LCPCs. You might see it written differently sometimes like LPC. 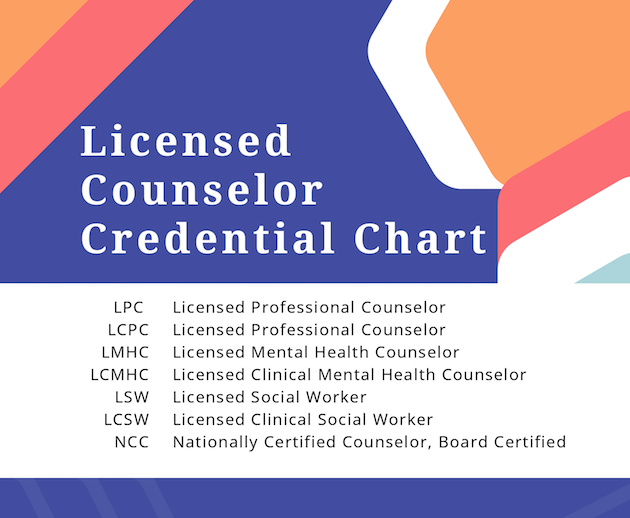 LPC stands for Licensed Professional Counselor. There are even more acronyms that refer to a licensed counselor. LMHC stands for Licensed Mental Health Counselor. LCMHC means Licensed Clinical Mental Health Counselor. The list goes on. See the chart below. Each State has slightly different criteria for granting licenses to people. And a State may have a different label for their mental health professionals. Whatever label is used, the word “licensed” is the first word. In short, the job of a State Board is to protect the health and safety of its State’s residents. they follow an ethical conduct of behavior and cultural sensitivity that respects people of all cultures, faiths and identities. In most States, like Maryland, the State Board also requires all licensed mental health providers to be fingerprinted. This is done so that full background checks from both the State and the F.B.I. can occur. If you’d like to learn more about Maryland’s Board of Professional Counselors and Therapists, click here. Clinical supervision training for licensed counselors who want to provide supervision to recent counseling graduates. These are called LGPCs or Licensed Professional Graduate Counselors. A sister profession to professional counseling is social work. A Licensed Clinical Social Worker (LCSW, LSW) is also referred to as a counselor, psychotherapist, and therapist. Of course, there known also as social workers. This profession is very similar to professional counseling and regulated by State Boards, too. The licensure and oversight process for social workers is just as rigorous as the process for professional counselors. Not all counselors are licensed. There are some counselors who advertise that they are family counselors or individual counselors or more, but they are not licensed. It can be misleading and that is unsafe. For your safety, confirm a counselor is licensed. It’s easy. In Maryland, you can find out if your counselor is licensed by clicking here. I hope this general information page has been helpful. Did you see errors? Think something should be added? Are you curious about more info related to this topic? Send an email. Home> Psychotherapy and Counseling> What's an LCPC?